I saw this on my instagram feed and I had to instantly make it. Love making some Shakshuka on my weekends off. 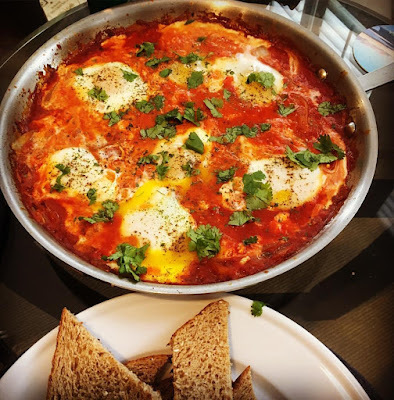 A perfect Sunday brunch for my husband and I. Shakshuka is a typical North African (Tunisian) dish of eggs poached in tomato sauce spiced with cumin, paprika, and cayenne. Here's my version of it. I highly recommend adding the feta cheese, it's delicious! I looked up recipes from epicurious and NYT cooking when making. Scroll through this simple recipe to make some Shakshuka (just so much fun to say). 2. Heat pan with olive oil over medium-high heat. Add onion and bell pepper- cook until soft for roughly 10-15 minutes. Add garlic- cook for another minute. Add cumin, paprika and cayenne- cook for another minute. Pour in tomatoes and season with salt and black pepper according to taste. Simmer until sauce is thickened for about 10 minutes. Add crumbled feta cheese. 3. Crack eggs in the skillet over sauce. 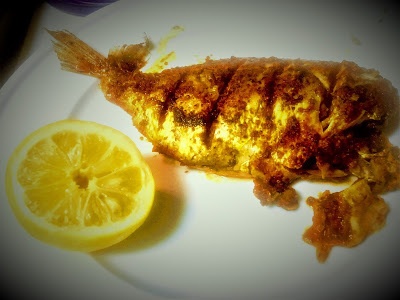 Season again with salt and black pepper. Transfer skillet to oven and bake until eggs are just set for 10 minutes. Lastly, garnish with cilantro.